At SafeSplash Swim School – Parsippany, we offer a wide range of swimming lessons and related services to meet the needs of our neighbors in Parsippany, Troy Hills, Montville, Lake Hiawatha, Mountain Lakes, Boonton, Denville, Wayne, Whippany, Morris Plains, East Hanover, Fairfield, Caldwell and other towns in northern New Jersey. We offer our programs on a year-round basis in our warm water facility and accept students as young as 3 years old. Our swim lessons run continuously on a month to month basis and each class is scheduled for a specific time and day each week. You choose your class time and day and we do the rest. We offer a range of tuition plans for our swim lessons that include discounts for multi-child families and multiple classes per week. Click here to view the tuition options we offer SafeSplash Swim School of Northern New Jersey. Our curriculum has been developed by a team of world class swimmers with over 30 years of teaching experience. We have the most up-to-date swimming technique to teach students how to swim the correct way right from the beginning! In addition to teaching water safety to every swimmer, our goal is to teach confidence in the water that will translate to all parts of your swimmer's life. Whether the goal is water safety skills or competing at an elite level, our program is designed to teach all ages and abilities. Our curriculum consists of 12 unique teaching levels, and uses a progressive teaching approach that allows for your swimmer to learn to swim comfortably at an individual pace while creating a learning environment that is not only fun, but allows for maximum skill retention. 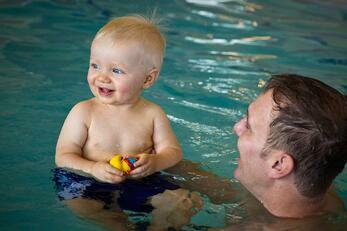 We are fiercely passionate about swimming and we are excited to take your swimmer from bubbles to butterfly! See what it's like to take swim lessons at SafeSplash by watching our video, SafeSplash Lessons from a Kid’s Perspective to get the full underwater experience! To find your swimmer’s level click here, or read more about our curriculum endorsed by Olympic Champion and professional swimmer, Missy Franklin. We are proud to provide this type of program to students of all ages. We love to make a positive difference in the lives of the families we serve. If you are interested in hearing more about our special needs program or the specific skills of the instructors we have available to teach these classes, please email us or call our service center at (973) 810-4562. It's never too late to learn how to swim or to perfect your swimming skills! From beginner to advanced we have a class that will fit you. Adult classes are tailored after the same skill progression taught in all of our classes, but the language and pace is tailored to adults. We introduce all skills to our beginner swimmers and work on strokes and endurance for our advanced swimmers. The SafeSplash Wave® program is an endurance, strength, and swim team prep program that works with swimmers who already have knowledge of the competitive swimming strokes and want to refine their swimming skills in preparation for swim leagues or teams the may be participating in such as the Bergen County Barracudas, Bergen Sharks, NJ Wave Runners and the New Jersey Wave Team. Our Wave program is broken up into 3 skill groups based on both physical conditioning and current knowledge of the strokes in accordance to USA Swimming standards and the SafeSplash curriculum. The program includes a set workout with a swim coach (out of the water coach) whose primary goal is to mimic an experience one would have on a recreational swim team. Since prior knowledge of the competitive strokes is required, stroke technique is coached, but is not the primary focus of the Wave.